My father used to tell me that appearances matter. When I was a teenager, we fought about this often. He insisted that the way we present ourselves affects how others see us. In my stubborn idealism, I insisted that he was wrong. I told him that what mattered was what we carried on the inside. What difference did it make if my jeans were ripped or if my hair was pink? The point is who we are and not what we wear. He would then ask me why I bothered to rip my jeans and dye my hair if appearances didn’t matter. . . . I never had an answer for that. I just stomped my feet and we argued all over again. Judging others based on appearances was materialistic. My pink hair was beside the point. A few years ago, I was in Chicago for a conference. It was one of those monster affairs, with 10,000 attendees from around the world. I wrote to a friend ahead of time to secure a dinner date before the conference swallowed our schedules with its hectic demands. We met at the door of the venue and happily escaped the madness for a much-cherished evening of friendship and conversation. Chicago is a big city and neither of us really knew our way around. My friend has a much better sense of direction than I do (in fact, most people do—I get lost just about everywhere I go! ), so I eventually succumbed to my disorientation and let her lead the way. We soon found ourselves standing at a busy intersection in the heart of the city. I remember trying to keep my footing on the small square of pavement I had secured, sandwiched as I was between so many others as we waited for the light to turn green. All of a sudden, a man pushed his way toward us and grabbed my friend by the wrist. Instinctively, I threw my arm out in front of her. Instinctively, she did the same for me. Despite our mutual gallantry, I was scared. The man had shoved people to the side to get to her. He was large and imposing. His clothes were torn and he smelled of the streets. His face was covered in tattoos and piercings. And he loomed over us, grabbing my friend’s wrist with his giant hand. There was so much commotion on that street corner that no one actually noticed. Everyone was busy with their own lives, rushing through the haze of the big city, looking elsewhere. For a split moment, I felt as though we had fallen off the edge of the universe. There was no one else. Just me, my friend, and this scary man holding her hostage. The night descended over us. “Are you Buddhist?” the man demanded of my friend. “Are you Buddhist?” he demanded again, still holding her wrist. She was wearing grey monastic robes. Her head was shaved. She is a Chinese Buddhist nun. The man moved in closer, towering over her short frame. He looked at her intently in the eyes and then said the last thing in the world I expected to hear. She took a moment to process what he was asking of her. Then she gently pulled her hand out of his grip, showing him how to let go. She whispered a prayer and lowered her head towards him. He lowered his to hers. When she was done, he bowed. “Thank you,” he said quietly. He then slipped back into the crowd and disappeared. I have often thought about this strange encounter. That man frightened me. Everything about his appearance represented danger. I had taken a step back from him when he had stepped in. I had put my arm out in front of my friend, to protect her from him. And yet . . . my point would not have gone very far, because there was more to the story than his appearance. My friend’s appearance was part of this story too. She was covered in her own set of markers. Her shaved head and monastic robes meant something too, and he ran toward her because of it. Her appearance mattered very much in that instant. She represented salvation. He had clung to her, just for a moment, as though she was a raft. 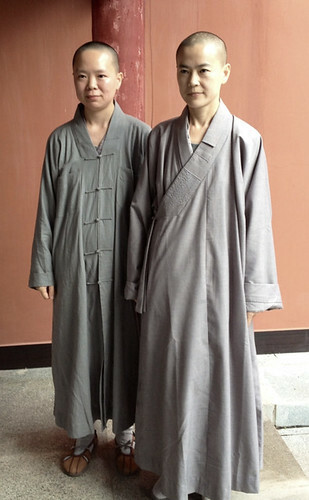 I have often wondered what it must be like to experience the world in monastic garb. I cannot really imagine it, because it is so different from the life I live. But I realized that day what a responsibility it is. Of course, I have always appreciated the academic arguments behind proper monastic behavior—to simplify one’s own life, maintain the respect of the laity, provide continuity for the tradition. Monastics have always had to carry the weight of societal expectations. But in the modern world, on a dark street corner in Chicago, I saw something more: I saw what her markers meant to a drowning man. In that moment, she was more than a gatekeeper for the tradition. She represented the way out of samsara. The way out of suffering. A moment of relief in what is otherwise a painful world. The way she looked made all the difference in the world.